Luxi Sleep created a mattress made of certified, best-in-class components paired with an innovative design, combining the very best in foam luxury for the most comfortable mattress around. Furthermore, it's fully adjustable. It’s What’s On The Inside That Counts! The "SBT" Foam Technology compresses and pushes back based on your body weight and pressure points for the perfect amount of sink and hug, no matter what your sleep style. This support Balancing Technology is an enhanced stability foam layer that offers support and cushioning for the higher pressure body regions, such as hips, shoulders, and back simultaneously. This ensures that your body is in proper alignment during your sleep. In particular this layer of pedestal-shaped foam offers support, airflow, softness control and minimal motion transfer which typically not found in other foam mattresses on the market. While it is not a memory foam layer, it is derived from that chemistry and presents as a more stable, faster responding and durable viscos elastic foam. This is a patent pending technology by Luxi Sleep. Luxi Sleep is adjustable mattress with 3 different feels- Soft, Medium and Firm. It has a zipper on the exterior of the mattress that allows for you to unzip the cover and access the foam elements on the inside. You can flip them to create different "feels". The Queen, King and CalKing are cut down the middle so its left and right side can be independently set for sleeper with varying sleep preferences. The insides consists of two easily-maneuverable layers that you can adjust the firmness anytime. Being an adjustable mattress refers to LUXI being one mattress that has 3 different feels- Soft, Medium and Firm. There's a zipper on the outside of the mattress that allows for you to unzip the cover and access the foam elements on the inside. You can flip these elements to create different "feels". *The Queen, King and CalKing are cut down the middle so the left and right side can be independently set for sleeper partners with varying sleep preferences. What is "Flip-It" and Split-It"? This is just their way of saying LUXI is adjustable in more ways than one. "Flip-It" - Luxi has offered you the luxury of being able to make your mattress Soft, Medium or Firm by simply unzipping the cover and flipping the elements to your desired softness or firmness layer. "Split-It" - Not all sleep partners can agree on a specific density when it comes to their mattress, so Luxi sleep has made it easy for you and split the mattress down the middle. By doing that, each person has the ability to personalize their side. 3 1/2 inch SBT Layer - A proprietary 4 lb. Density foam architecture that offers air flow and resists sagging and body impressions. The three SBT, Memory Foam and Latex layers are wrapped in a interior cover fabric to enhance durability and the ease of flipping it adjust the mattress “feel”. 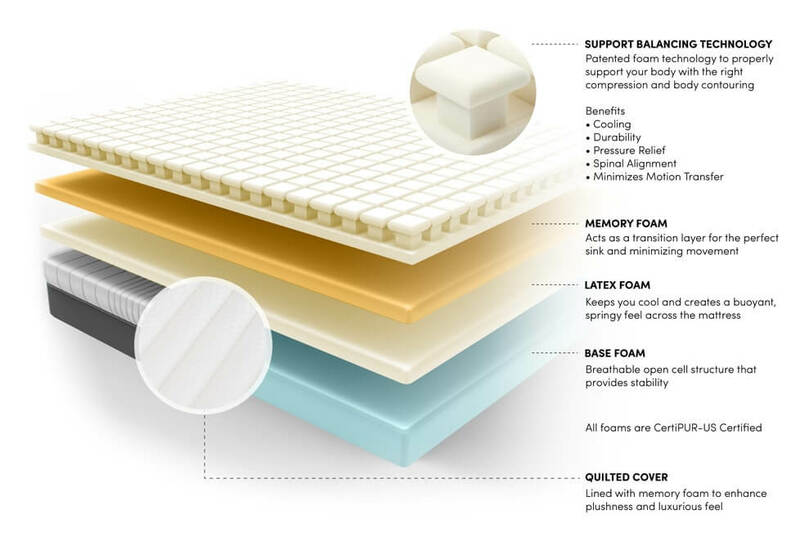 These materials allow us to deliver one mattress with three different “feels”: Soft, Medium and Firm. All you have to do is unzip it, and flip it to change the way it feels and love it. Is Luxi Sleep Mattress Organic and Hypoallergenic? Luxi Mattress Contains no PBDEs or formaldehyde. The foams are (true for all mattress foams) petrochemical based. However, their foams are also made from formulations (the most modern specialty pour formulations from companies such as DOW, Mobay and Chargile) that contain some agricultural components. This essentially replaces some of the petroleum based materials with vegetable oils. 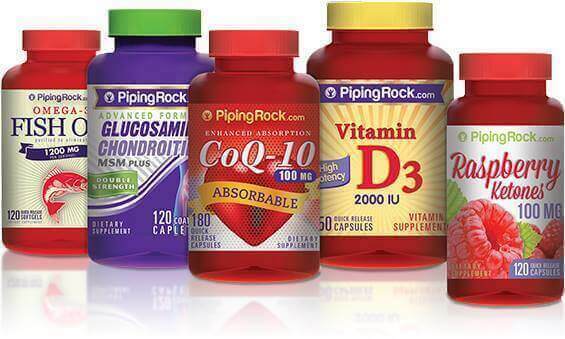 These "plant based formulations” are used in all layers of the construction. Technically speaking, all of the foams are polyurethane chemistry based but there is no PVC. The Latex layer is a blend of polyurethane and natural Latex that is derived from the sap of a tree. All LUXI raw materials are from a class of raw materials (the conventional foam, memory foam and Latex) that is state of the art in terms of being “agriculturally considerate”. There are no other materials available anywhere that could be substituted into the build of the LUXI mattress that would be considered more “Plant Based”. However, that does not make the material edible and we have no knowledge about casein proteins being present. The suggestion is that someone along the line has confused the truth about having a part of the chemistry being "Plant Based” and that that would have any other benefit (nutritionally) than displacing some of the petro-based material. All raw materials involved in the construction of a LUXI Mattress have been chosen to be from the most current material innovations and (both the foam and Latex components) are essentially inert and odor free. Twin XL 38" x 80"
Cal King 72" x 84"
How much does the Luxi Sleep Mattress weigh? Twin XL - 50 lbs. Cal King - 102 lbs. What is included the 1000 Night Trial? Your confidence in the LUXI mattress is secured in four ways: “Try LUXI for 30 nights and take up to 100 nights to decide to keep it” and if there are changes in your sleep anytime during the first 1,000 nights, they will use their ability to be customized and keep things right at no additional charge. All this, and a 10 warranty against material defects and poor workmanship and you’ve got the biggest confidence package offered by any online mattress retailer. You must complete a (30) consecutive night Break-In Period. Individual preferences take that long to develop. And, then you can return your LUXI anytime up to (100) nights if it’s not perfect for you. And, you can realize LUXI's custom potential to keep pace with your changing needs over the next (1,000) nights. And, you will always be protected against defects in materials or poor workmanship by Luxi Sleep's (10) year, non-prorated warranty. All foams are *CertiPur certified and have an open cell structure that insures no long term or lingering problems from off gassing. What if you are allergic to latex? If you are allergic then there are a few things to note if you have concerns; the Latex that Luxi Sleep uses is a natural blend not 100% latex, the latex won't be in direct contact with your skin as it is in the element and wrapped in a sock like casing and there here won't be any off gassing or inhalation of latex or other fumes. What is the Warranty offered by Luxi Sleep? Luxi mattress promises (10) year product warranty. Pretty much all the normal stuff, meaning, that if there is any fault in the design or workmanship of your “LUXI” mattress that it will either be repaired or replaced at any time these problems are discovered during the (10) year Warranty. Where is the Luxi Sleep mattress made? Luxi is made in the US - handcrafted and made just for you in sunny Southern California. What is in the cover? How is the foam cooling? Memory foam technology has certainly advanced and has generally become cooler and in order to remain cool you need a mattress that extracts heat from the side of the mattress(not the top). 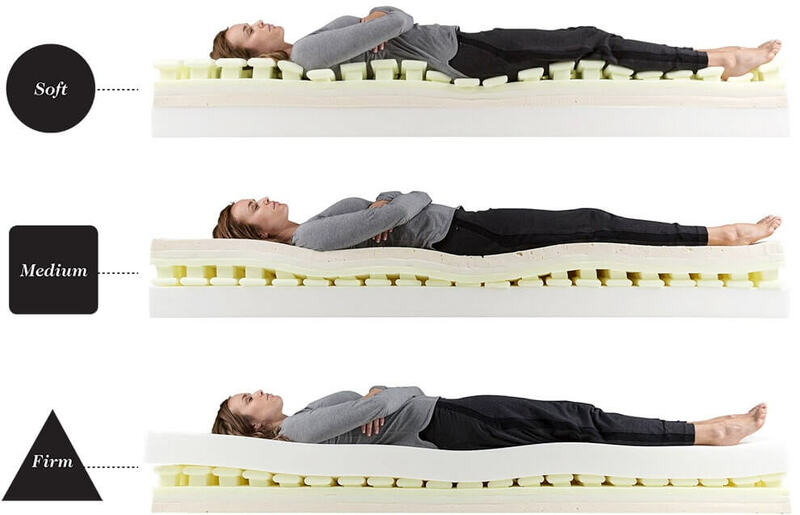 The LUXI has core shapes that operate independently for great pressure relief, but also function more like a series of channels running horizontally both from side to side and from head to toe, so that when the mattress is being compressed (from someone lying on it) the movement of air is laterally displaced out the sides. The LUXI will most likely be slightly cooler due to the amount of free air flow through the sides of the mattress. The LUXI is handcrafted and made to order in Southern California. It takes 3-5 business days to make your Luxi and then depending on where you are located it takes 1-5 business days once it is in transit. If you have any special requests then contact one of their Sleep Team experts and they will be glad to assist you. The Luxi is shipped via FedEx and is trackable though FedEx.com. User our Luxi mattress coupon code to receive free shipping to Mainland US, Hawaii, Alaska and Canada. You do not need to sign for your delivery if you are in the US but a signature is required for deliveries to Canada. If you are in need of mattress disposal Luxi ha[s a partner who can work with you to pick up and take away your old mattress. There's an extra charge depending on where you are located. If you are interested in this, they can help coordinate. Get free shipping on your mattress using our Luxi discount code. Box size depends on the size of the mattress. LUXI sips in the following sizes. Twin: 44" x 16" x 16"
Twin XL: 44" x 16" x 16"
Full: 44" x 16" x 16"
Queen: 44" x 19" x 19"
King: 44" x 19" x 19"
Cal King: 44" x 19" x 19"
Luxi's mission is to use their mattress to its fullest to give you a better night sleep, but with most economically and environmentally responsible way. Every year, approximately 4.2 million mattresses and box springs are discarded in California. Customers who misuse the free trial programs not only drive up the mattress costs but also cause other damaging environmental and socioeconomic consequences. The recent spike of online mattress sales has increased the need of environmentally friendly way of disposing mattresses because the returned mattresses cannot be legally repackaged and resold. Several charity organization has stopped accepting mattress as donations, thus most of such mattresses end up into landfills instead, resulting in damaging environmental impact. Whereas, Luxi does not encourage customers shopping multiple mattress into the home only to choose one and return others, without taking the time to experience the mattress and explore whether it really suits their sleep habits. Luxi has spent a great effort in designing the Luxi mattress to ensure its adaptability and adjustability to your body shape, thus minimizing the likelihood of you returning their mattress. The Luxi Sleep mattress certainly offers a unique benefit allowing you to customize the firmness of each side of the mattress so that you and your partner can sleep better regardless of your sleeping preference and style. We find this as an unique and useful feature. We believe it can be a great option for sleepers who are undecided about how much firmness they want. With its 3-in-1 customizable firmness feature, unique four layers of varying foam types,and its specialized Flip-It and Split-It features, the Luxi mattress provides benefits that allows it to differentiate itself from other mattress products in the market. It certainly deserves our 9.7 of 10 rating. Take $200 Off Luxi Mattress, 1000 Night Trial, 10 Year Warranty and Free Shipping at Luxisleep.com. Use our Luxi Sleep coupon at checkout. Shop at Luxi Sleep today and enjoy the $200 Luxi discount on your order. Click below and the Luxi Sleep coupon code will be provided at the offer page. Get $200 Off Your Mattress + 1000 Night Trial + 10 Year Warranty + Free Shipping at Luxisleep.com! *Luxi Sleep promo code is valid on Luxi mattresses of all sizes. The Luxi Sleep coupon will be provided at the offer page.